Create a customizable storage unit with the Regency 18” deep wall mounting bracket set for chrome wire shelving. 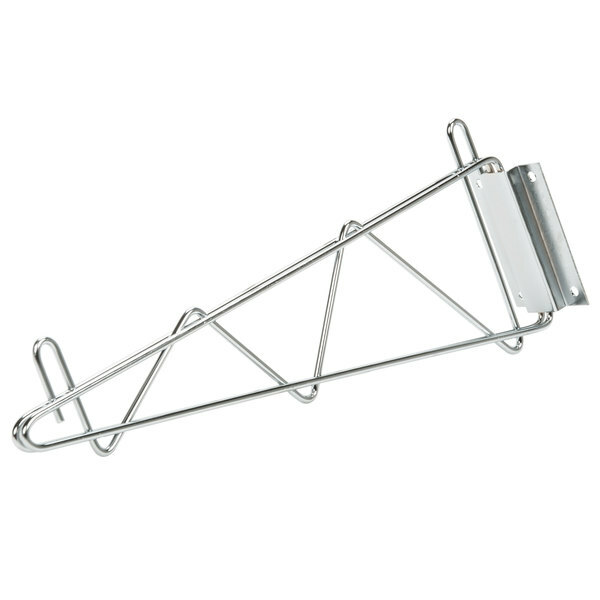 The Regency 18” deep wall mounting bracket set for chrome wire shelving makes it easy to keep your business organized. Crafted from strong metal materials, this item is ideal for use in dry storage or heated environments, like warehouses, garages, stockrooms, and retail settings. Best of all, since this bracket set is designed to mount onto the walls of your establishment, it’s sure to meet your needs. "Sturdy, sturdy, sturdy... Regency wall mounting brackets are rock solid and make for an easy install. The versatility and variety of components offered is outstanding!" This product is made of durable chrome plated steel, making it ideal for dry storage or heated environments. As such, it is the perfect choice when mounting shelving for disposables, aprons, or extra kitchen tools. 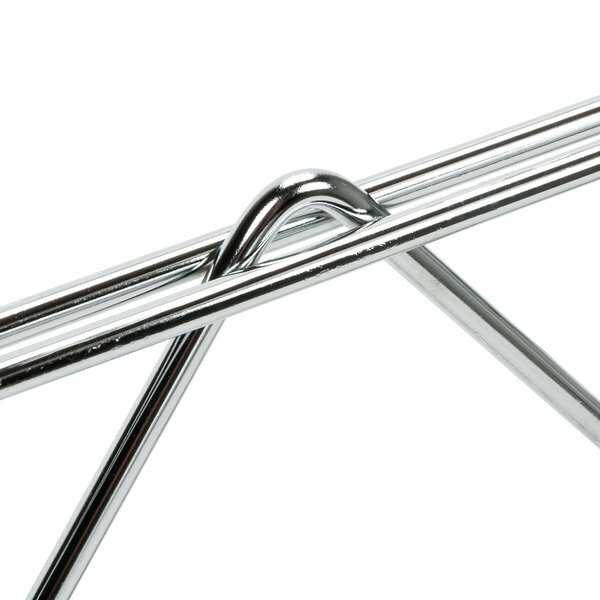 While this bracket is mostly intended for back-of-house use, its classic styling and silver color also makes it appropriate for retail use. Because this product also comes with all of the necessary hardware for installation, setup is quick and easy. This wall mounting bracket set is sturdy, heavy-duty, and space-efficient, making it a versatile option for any business. 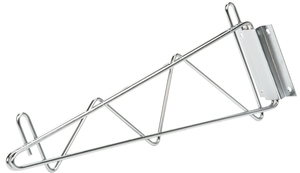 This bracket is specifically designed to work with any length of 18" deep Regency wire wall shelving, thereby maximizing your storage and display area. Can I mix and match Regency shelving components with other popular shelving brands? Regency shelving is designed to work with many popular brands of shelving, including Metro Super Erecta and Advance Tabco. However, it's important to note that each type of component must be from the same brand, due to minor variations in size between brands. For example, you can use Metro Super Erecta shelves with Regency posts, but all of the shelves must be Metro and all of the posts must be Regency. However, you cannot use a few Advance Tabco shelves and a few Regency shelves on the same set of posts at the same time, or two Metro posts and two Regency posts on the same shelving unit. Would the mounting hardware included work on any surface? If you are mounting these brackets on any surface besides concrete, you need to use different mounting hardware. How important is the weight capacity of my shelving? It is imperative to consider weight capacity when selecting a shelving unit for commercial applications. Not only does weight capacity affect how much product can be stored at one time, but it affects how well the unit withstands use. If a unit is used to hold more weight than it has been approved to hold, the excess weight will compromise the unit’s integrity, damage its construction, and potentially void its warranty. Plus, because storage needs evolve with a business, selecting a unit with a high capacity can help ensure that it accommodates both immediate and future needs. Can I use this mobile shelving unit as a cart? 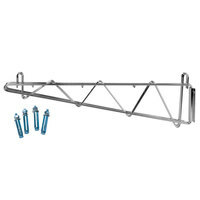 While casters do make the rack mobile, it is still designed for storage and not for transport applications. Moving it from the wall for cleaning is an appropriate use of its mobility. Metro HK23C Equivalent Chrome Small Snap-On Hook - 1 1/4" x 3 1/2"
In all my years, I've never encountered such consistently sub-par hardware. 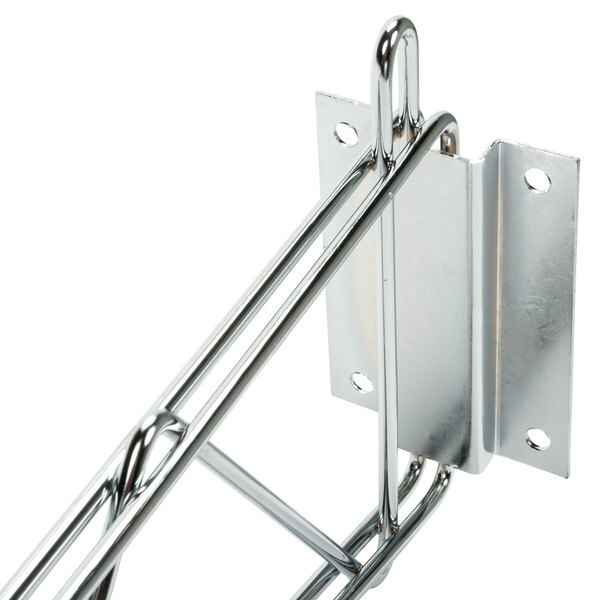 The shelf bracket is sturdy, yes, but the hollow wall anchors, included with this item, are so cheaply made that I recommend buying your own anchors instead of relying on the ones included in your purchase of this item. I'm mid-install. I've drilled my holes and inserted the anchors into the holes. I've attempted to tighten 2 of the anchors, only to have the nut strip out on my as soon as it gets to a point where there's any tension at all. I do not recommend. We appreciate your feedback! We’re sorry this didn’t work well for you! Please remember our Customer Solutions team is happy to help should you have any issues. Very easy to install. These come with concrete wall anchors. If you plan on getting these into studs you need to buy your own wood screws. These are really great: allowed me to wall mount several shelves I had laying around. Very, very heavy duty and secure, impressive for the price. Fastened properly they take a LOT of weight. 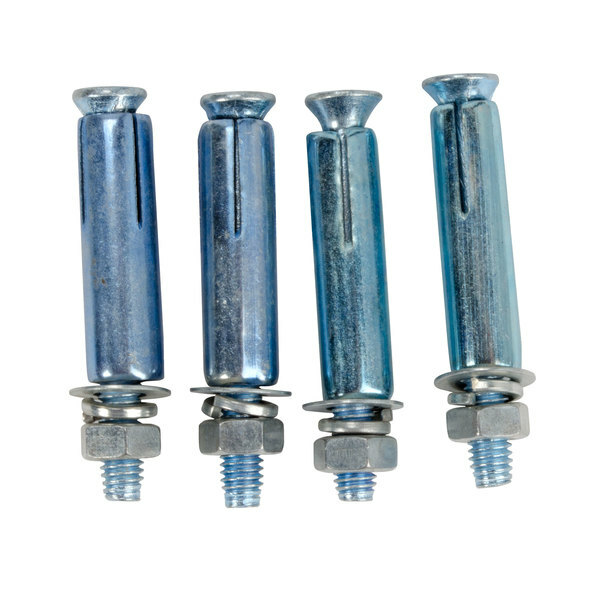 Get good appropriate fasteners for your substrate. makes your life a lot easier with the post, they fit the shelves easy and once you find the stud in the wall, if you are not putting it into a brick wall it is very easy to install. what makes this great just the post are mounted to the wall so you could still remove the shelf and clean when you need to. Good mounting bracket for the wire shelving. Very easy to install and durable. Literally takes just a few minutes to mount. Can't make it any easier. 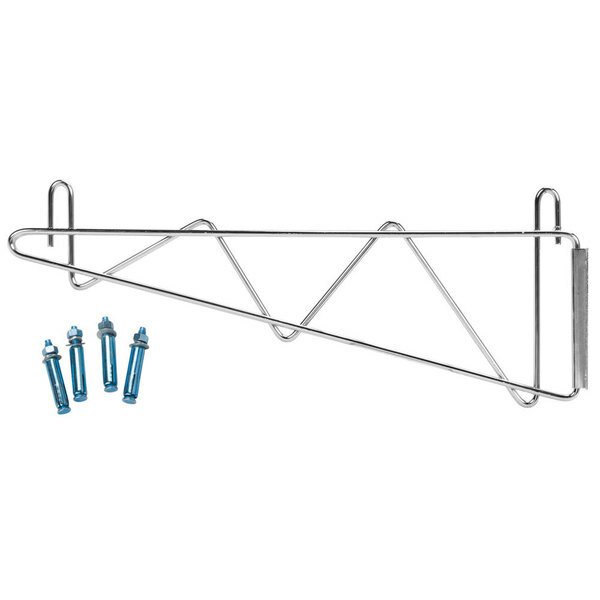 Great product they are well made and heavy duty and they look really nice except for the bolts that come with it , they do not work with the walls we have other than that they are perfect . Very nice brackets at a great price. We already had some different brands of wire shelving and these brackets have worked perfectly... no sagging forward even when they have a lot of weight on the shelves. They come with concrete anchors, so be aware you will need to find another way to anchor them if your wall is not concrete. We used lag bolts and put extra 2x4s behind the walls for reinforcement. Plan to buy more. 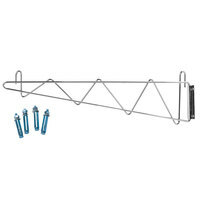 These are heavy duty and work perfect with the wire shelf’s webstaurantstore sells. Wasn’t to hard to mount on the wall with the included hardware. Easy to install and super sturdy these Regency deep wall mounting brackets will keep your shelves , secure even with the heaviest loads on them. I use them in the garage , laundry room , Workshop , kitchen , you name it. Honestly I am not sure why they come with concrete anchors, but I got some drywall mollys and put this up and it is perfect. simple install and great value. We have bought these a few times from The Webstaurant Store. They are very well made and support a metro shelf perfectly. Also the price cant be beat. Absolutely loved these brackets! We had some extra shelves left over and these brackets were a great way to use them as wall mounted shelves! We really wanted to secure the shelf well so we upgraded the mounting screws at our local hardware store! But the brackets hold the shelf nice and sturdy! They hold everything from pots and pans to #10 cans with ease! This 18 deep bracket is great product, excellent for making shelves, easy to install and clean and also very durable. We have been using it for almost six years without any issues. Perfect for wall mounting your wire shelving. I had some extra shelves that fit on 1.5" legs, and these brackets still work well. You may need to purchase additional wall anchors depending on your mounting surface. Solid construction and very durable. This deep wall mounting bracket holds a lot of weight on it, and was really easy to hang up on the wall. Solid deep wall mounting bracket. The chrome is very appealing to the eye, and really easy to clean. I put a lot of weight on this bad boy, and it holds up just fine. Purchased these Regency 18" Wall Mounting Brackets to go with some extra wire shelving that I had left over. The bracket is nice and sturdy. these brackets are well made and fit my metro shelving just fine. I have them hanging between my ceiling and door top and have plenty of room. These brackets were the perfect fit for our Regency 18" shelving. They were easy to mount and included the all the hardware needed to ensure it was installed safely. These Regency brackets combined with the Regency shelving are the way to go. I did have a couple issues swapping brackets and/or shelving between some existing shelving I had that was another brand and slightly different design. Just buy all Regency and make sure you get the right size brackets for the shelf you are buying. These work great for our shelves and much cheaper than other places we looked for these. They were a lot harder to find than we thought! Unbelievably cheap compared to competing brands and retailers. Don't waste your money on the hardware store closet shelving when you can have a much higher quality setup for around the same price or even cheaper. We didn't use the anchors it came with as we were able to hit a stud with each bracket. Easy to install and use forever. Very sturdy. We can pile all the dishes and the heavy bowls of the mixers without worrying of a shelf collapse. Super shelf support at a great price. I recommend installing into studs when going into a sheet rock wall to make sure it will hold. Very sturdy and well made. We like regency as an alternative to the other major brand. The quality is high and the price is right. Make sure you get the right anchors for the wall you are attaching this to. I looked for a while for these brackets for my NSF Metro shelving, and found the cheapest price here, even with shipping included. Brackets work great with shelves, be sure to measure correctly! Easy to install and so sturdy .They go perfectly with the Regency wire shelves.No body can beat this price.The included hardware may not be usable, but I use the toggle bolts with the dry wall which hold every thing tight and sturdy up to 300lbs easily.Thanks to Webstaurantstore.com for providing nice products for low price. Sturdy, sturdy, sturdy... Regency wall mounting brackets are rock solid and make for an easy install. The versatility and variety of components offered is outstanding! I got these from Webstaurant for half of the price of the catalogs you get in the mail.The only problem I had was with mounting because the hardware that comes with it is not for hollow walls like mine.